“Fortune favors the brave”. An expression that could describe Alexander Albon’s up-and-down career as a racing driver. But the Anglo-Thai, aged 22, never backed down against difficulties and is about to fulfill a life-long goal by entering Formula 1 in 2019. 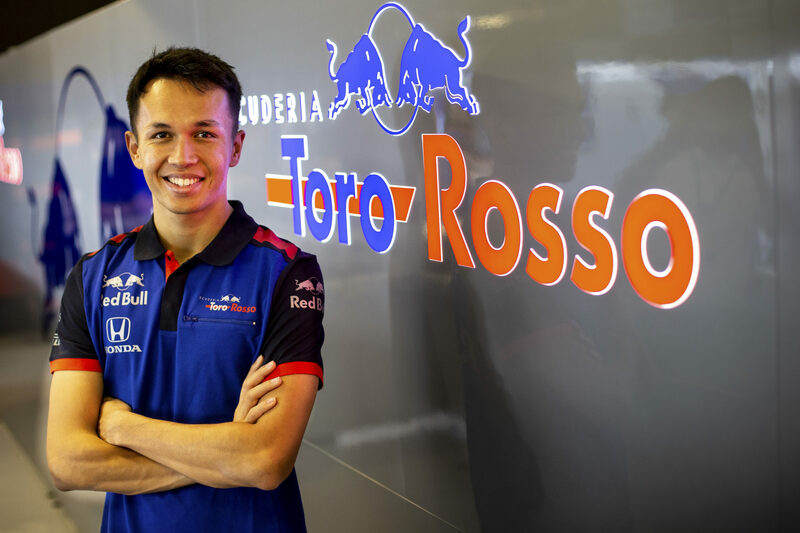 To write that Alexander, or Alex, Albon is a happy man would be to underestimate the young man’s real state of mind when we talked to him in the wake of the announcement, made in Abu Dhabi following the last F1 Grand Prix of the 2018 season, that he would fill the seat of the departing Brendon Hartley at Toro Rosso for the 2019 season. To better understand Albon’s feeling, one must know about the sense of relief that accompanied the news after weeks of speculations around the identity of the driver that would finally join the already-confirmed Daniil Kvyat in the Italian team.“There’s been quite a lot of stress these last months and the announcement came more like a relief”, he confirms. If his name had been on the table for quite a while, planets took time to align for Albon as he had previously secured a three-year deal with Nissan to enter Formula E in season 5 (2018-2019). As the future didn’t look so bright once his F2 campaign would end, going full electric appeared to be the best option at the time. The new Toro Rosso duet for 2019: Alexander Albon and Daniil Kvyat at the F1 End of Season Testing at Yas Marina Circuit on November 27, 2018, in Abu Dhabi (© James Bearne/Getty Images). Studying is one thing. Staying sharp is another. Apart from the simulator, Albon has no intention of staying away from a steering wheel in the cold days of Winter. “I’ll do a lot of karting, something which Toro Rosso really believes in for the drivers to keep fit,” he adds. “Obviously, it’s not the same as driving a single-seater but it’s enough to keep you sharp and it’s going to be good fun. I’ll be based in Lonato in January and February, because we’re not far from the Toro Rosso factory in Faenza but also because the guys from my old team, Intrepid, are in the same area. George [Russell, the new Williams F1 driver for 2019, ed.] and I have been trying for a while to get karts sorted out in the UK but never got round to it. So, when I told him I was going to be in Italy, he said: ‘ok let me know, so we can go race together’ [laughs]! Albon at the wheel of his Intrepid chassis at the FIA Karting European Championship – KF3 on the “Home of Champions” track of Genk, Belgium, in 2010 (© KSP). It’s no big surprise to hear Albon’s delight to get back behind the wheel of a go-kart. Like most of his colleagues, he has cultivated his love for motor racing at an early age through the practice of karting on a local, then international, level. Even though F1 was the main topic of our discussion, the temptation was too big to walk down memory lane and know more about this young guy’s journey. Luckily for him, Alexander could very early in his life count on a strong supporter. Albon (Intrepid chassis n°101, center) on his way to a KF3 World Karting Cup victory in Braga, Portugal, on September 12th, 2010 (© KSP). Do you want to know more about Alexander Albon’s journey to F1? Click here for the second part of our interview with the new Toro Rosso driver! Double victory (Races 1 and 4) at Round 2 of the FIA Karting World & European Championships – KF1 in Zuera, Spain on July 24th, 2011 (© KSP).